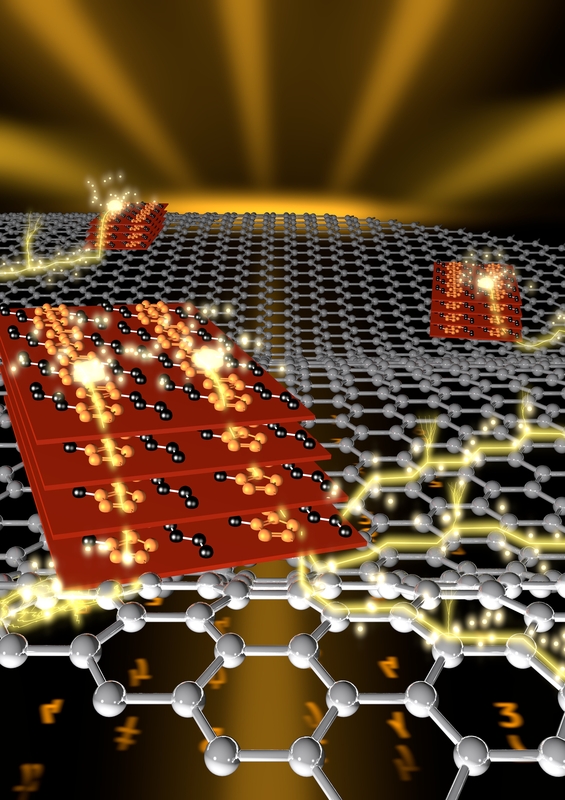 In a landmark experiment that may lead to more efficient organic electronic devices, researchers at the Department of Energy’s SLAC National Accelerator Laboratory discovered that applying a thin film of semiconducting polymer material to a single layer of graphene allowed for transporting electric charge better than when placed on a thin layer of silicon. “Our results are among the first to measure the charge transport in these materials in the vertical direction — the direction that charge travels in organic photovoltaic devices like solar cells or in light-emitting diodes,” said David Barbero of Umeå University in Sweden, leader of the international research team that performed the experiments at SLAC’s Stanford Synchrotron Radiation Lightsource (SSRL). It was widely believed that a thinner polymer film should enable electrons to travel faster and more efficiently than a thicker film. But counter-intuitively, Barbero and his team discovered just the opposite: that a polymer film about 50 nanometers thick conducted charge about 50 times better when deposited on graphene than the same film about 10 nanometers thick. To explain why, the team suggested that the thicker film’s structure, which consists of a mosaic of crystallites oriented at different angles, likely forms a continuous pathway of interconnected crystals. This, they theorize, allows for easier charge transport than in a regular thin film, whose thin, plate-like crystal structures are oriented parallel to the graphene layer. A one-atom-thick sheet of carbon with highly desirable electrical properties, flexibility and strength, graphene shows great promise for future electronics, advanced solar cells, protective coatings and other uses — and combining it with other materials could extend its range even further. The crystallization and electrical characterization of the semiconducting polymer poly(3-hexylthiophene) (P3HT) on a single layer graphene sheet is reported. Grazing incidence X-ray diffraction revealed that P3HT crystallizes with a mixture of face-on and edge-on lamellar orientations on graphene compared to mainly edge-on on a silicon substrate. Moreover, whereas ultrathin (10 nm) P3HT films form well oriented face-on and edge-on lamellae, thicker (50 nm) films form a mosaic of lamellae oriented at different angles from the graphene substrate. This mosaic of crystallites with π–π stacking oriented homogeneously at various angles inside the film favors the creation of a continuous pathway of interconnected crystallites, and results in a strong enhancement in vertical charge transport and charge carrier mobility in the thicker P3HT film. These results provide a better understanding of polythiophene crystallization on graphene, and should help the design of more efficient graphene based organic devices by control of the crystallinity of the semiconducting film.